Conifers are easy to enjoy any time of the year. These trouble-free evergreens offer year-round beauty and provide shelter for birds and other wildlife. We asked an expert for his favorite plants and tips. Orthopaedic surgeon Harrison Tuttle started collecting different types of conifers several years ago when he moved into his home on a half-acre property in Raleigh, North Carolina. Today he has a collection of more than 500 conifers (from 16 genuses), including cedars, cypresses, firs, junipers, larches, hemlock, pines, redwoods, spruces and yews. We caught up with him to learn his favorites and to get a few tips for growing these evergreen beauties. What about conifers attracts you? Color, symmetry, shape, texture and four seasons of interest. Do you have a favorite conifer? Yes! 'Skylands' Oriental spruce (Picea orientalis ‘Skylands’) is beautiful with two-toned needles, nice symmetrical conical form with graceful upsweeping limbs. Are you a proponent of staking? Only to create an interesting form with a weeping cultivar or to coax along a new graft or to try to straighten up a plant that’s tilted over after planting. 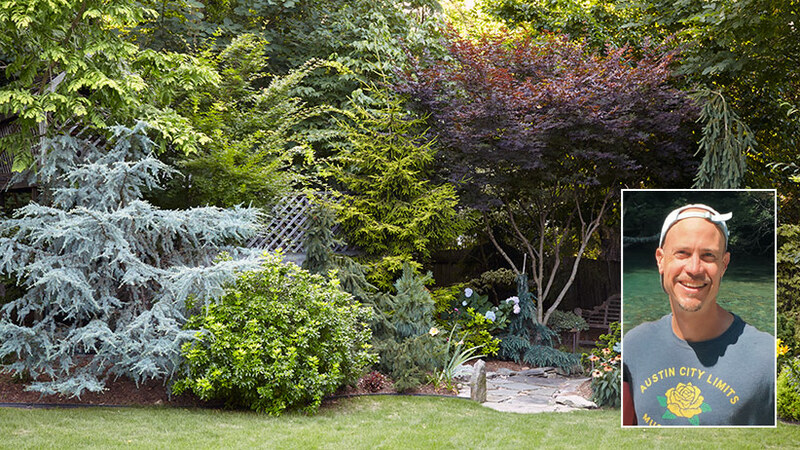 Are there conifers that can tolerate more shade than others? Oriental spruce (Picea orientalis) and Canadian hemlock (Tsuga canadensis) are both gorgeous species that are very shade tolerant, but they also grow in sun if given enough moisture. Deodar cedar (Cedrus deodara) grows in a surprising amount of shade, too. The blue prostrate forms look OK in these conditions. Any rules for combining colors? Contrast is good. Reds complement greens and blues. It’s hard to be gaudy with conifers, so the more showy, the better. Balancing shape and color in a bed is good and one way to keep a bed from being gaudy. Contrasts with shapes and forms keep the garden from looking too formal or boring. Favorite fastigiate varieties for smaller spaces? Weeping white spruce (Picea glauca ‘Pendula’) is phenomenal. Weeping Nootka cypress (Chamaecyparis nootkatensis) varieties, such as ‘Strict Weeping’ or ‘Green Arrow’. I’m OK with it with funky or freeform conifers for shaping. If there are two leaders, it’s OK to snip one. In tight spaces, like my yard, you may need to limb up some of the larger-growing trees. Candle pruning has a role for creating artistic pines. “I water abundantly with well water,” says Harrison. Tips for growing firs in the Southeast? Only a few select firs — Japanese fir (Abies firma), West Himilayan fir (Abies pindrow) and Wilson fir (Abies recurvata) — will grow outside the mountains. So in order to have a chance with the more ornamental species, they have to be grown on Abies firma rootstock, which is only available at boutique or mail-order nurseries. And they’ll be very small when they’re purchased. Good to mix them with deciduous trees like maples and redbud, which are hard to mess up. Also combine them with flowering shrubs and perennials. Hostas are great compliments. Is there a holy grail of conifers? Well, taiwania (Taiwania cryptomerioides) comes close. Greenish-blue, two-toned foliage with graceful weeping branches that curve up at the tips. When grown well, it’s absolutely spectacular. It needs cool, moist conditions, but it’s not very cold-hardy and does great in coastal Pacific Northwest, from what I can tell. It’s impossible to find seedlings and rooted cuttings can grow sideways for 20 years before they shoot upwards! I’ve had no luck obtaining viable seeds. Keep hummingbirds well-fed and coming back to your garden for more with these four plants guaranteed to attract hummingbirds. Chances are you’ve spotted one of these common pollinators in your garden. But do you know how they pollinate and which flowers they love? Learn more here! Don't feel limited in your shade garden. Mix it up and add color to your garden with these 6 unique spring flowers!